We did a night summit on Mt. Baldy and camped on the peak. What a treat! Mt. San Antonio, also known as Mt. 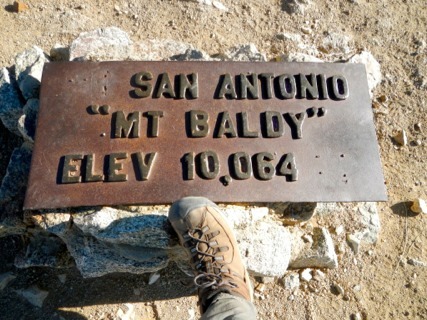 Baldy, is the tallest peak in the San Gabriel Mountains of Southern California. Mt. 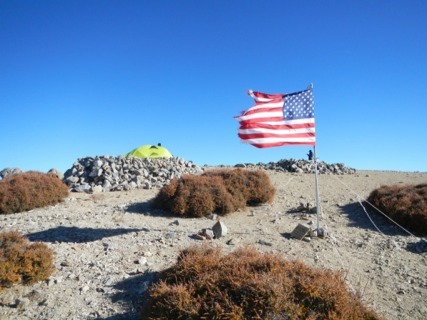 Baldy is visible from much of Southern California and much of Southern California can be seen from its summit on a clear day. There are four popular routes to the summit. All are considered moderate hikes of 8.5 to 13 miles round trip and anywhere from 3,600 feet to 6,000 feet of elevation gain. All routes can be hiked year round but you’ll need snowshoes and/or crampons and ice axe during winter months. (Winter can be dodgy). From highway 10 exit either on Mountain Blvd. or Euclid Blvd. and travel north. Follow signs towards the Baldy Ski Lifts (aprox 15 miles). For the Bear Canyon/Mt. Baldy Village Trail, park on Bear Canyon Road down in Baldy Village (aprox 3 or 4 miles before the lifts). You can drive through the church car park, and there is parking by the gate near the end, where the sign in book is. This trail is the longer trail and the one we chose for our night ascent. Walk to the end of the road where a sign leads to the trailhead. For the Baldy Notch/Devil’s Backbone Trail and the Baldy Bowl/Sierra Club Hut Route park in the dirt pull-outs by Fall’s Road at Manker Flat (1/2 mile before the lifts). For the Blue Ridge Trail take highway 38 from intersate 15 towards the town of Wrightwood. Take the Angeles Crest Hgwy to the dirt road to Guffy Campground and Prairie Fork. Follow the dirt road 6 miles to a junction and go left. Follow aprox 1.7 miles and park in a pull-out and the base of Pine Mt. If coming from the west on hwy 210, exit Baseline Rd. and turn left at the first signal and then right on Padua. Then right on Mt. Baldy Rd. Saves you a couple of miles on the freeway. No wilderness permits are required. A National Forest Adventure Pass is required for your vehicle while parked at the trail heads. The pass can be obtained from the ranger station in Baldy Village or in Big Pine. Many local merchants also sell the pass. The cost is $5.00 a day or $30.00 for an annual pass. You can get away without it, but may have to walk a little further. Camping and a fire/stove is allowed with a free permit, be obtained from the Angeles National Forest District for use of camp stoves or camp fires. You can get them at the rangers station in Baldy town also. So the Bear flats trail/ Bear Canyon is the more strenuous of the hikes. It is a touch over 12miles round trip, but you have just about 6000 feet of elevation gain. Be prepaired for this hike, it is not a walk in the park. During the summer months it can be really exposed to the sun, really hot and there is no water to be obtained, except just as you hit the bear flats before the switchbacks. There is a small creek that runs all year round (Filter needed), but that is it, you are on your own from here. It is common to run into dog owners in trouble, new hikers out of fluids and food, or badly sunburnt hikers on this trail. It can be easy to underestimate it. So summer hike, 3 litres minimum of fluids, 2,000 calories of fuel (food) and electrolytes, bring tape for blisters (the elevation gain of 1,000ft per mile, tests boots and feet), heavy sunscreen, cap, light outer layer and light windbreaker for summit and good boots, or trail shoes as it is easy to roll an ankle here. leave early and give yourself time, (usually but not always) 8+ hours for the bear flats trail round trip. Winter and Spring have some different planning rules. There is usually snow, ice and wind. This is not an easy hike in the winter months. The trail is usually fine until about 7,000 feet, where you will probably hit the snow-line. Be sure to prepare, boots, underlayer (Spandex/polyester), outer layer, windbreaker, rain shell, extra food, per day 2,500 calories plus trail food. You will burn the energy up trying to keep warm. 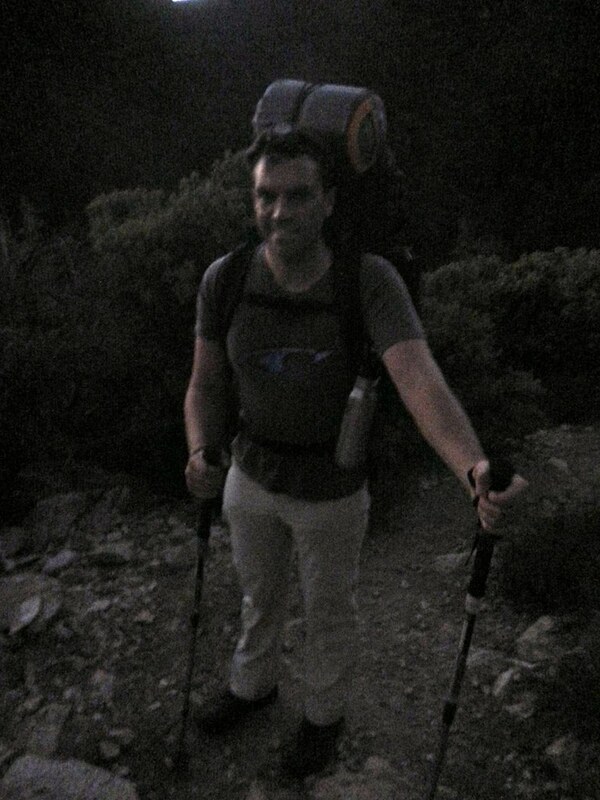 We left late on a friday evening, and began on the Bear Canyon/ Bear Flats trail at 8pm. We began with a 52lb pack, overweight for sure, we could trim it down but we are training. 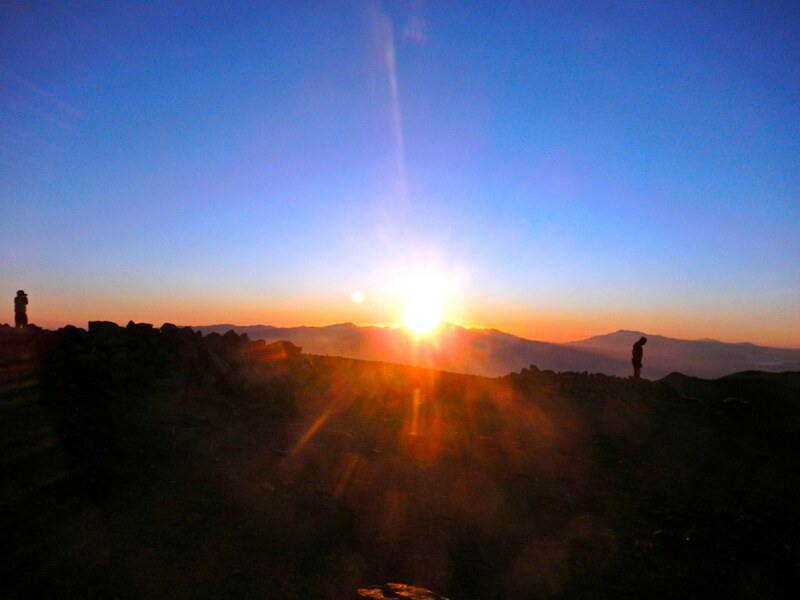 With the sun down, it can be a much more intense hike as you climb by headlamp and moonlight. This trail when dry gets dusty and is also a mind game as it is so intense a trek with a heavy pack. You go about 1.2 miles to the creek up some switch backs, cross the creek, across Bear Flats and then it begins, the dry, slippery switchbacks which will challenge your endurance and balance. This is where hiking poles help, pack on your back or not. Especially on the down hills, it will help your knees out and with slipping as the rocks and stones roll under you. Once through the switchbacks, you continue along the trail which is steep for sure, not as slippery and with great photo opportunities for surrounding peaks. At night it is cold, it starts off a little warm, but as you move up, be sure to have your next layer handy. It gets a little more exposed the higher you go. The winds can just cut through your clothing and chill you to the bone. We pushed on for the summit, which you can see from about the 4.5 mile mark as you cross the first exposed and bare ridgeline. Then push on for the summit. As we reached the 9,400 feet mark in elevation, coming from the ocean, we began to feel the elevation, so think about bringing Advil or something to help with that. As we approached the summit, about 1am, it took us another hour in 50+ mph winds to actually set up our camp on the summit. 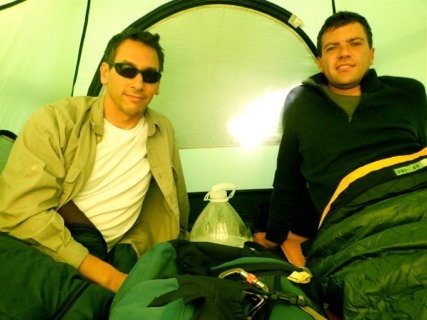 Remember, the summit is BALD, no dirt, so nowhere to stake down your tent. Free standing tents are better, but you can use sticks and rocks to hold them in place. A recommendation is once you have the tent ready to go, out of your packs, put your packs inside the tent to stop it taking off as you put it up. It was so cold on the summit, the wind whipped away any heat you could create. Ear plugs are helpful as the wind can pick up even more and your tent flaps away, keeping you awake. Once we left the summit the next day, the descent was slow, due to weight and the terrain, which is very slippery, with scree, debris and dirt. The night was so cold it froze us to the core, until we had our cup of tea and mashed potatoes…..
Keeping hydrated is key at this elevation, cold and hiking intensity.